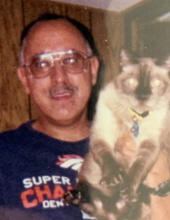 Edward Larry Gallegos entered into rest December 28, 2018 in his home in La Junta, Colorado. Edward was born July 29, 1968 in La Jara, Colorado. He was 50 years of age. He is survived by his parents Betty and Tony Gallegos of La Junta, Colorado and several aunts, uncles and cousins. He is preceded in death by his grandparents Samuel and Abrelia Bernal and Dan and Beatrice Gallegos. Edward was a wonderful son. He has always taken care of his parents. He always enjoyed collecting Elvis Presley and Marilyn Monroe memorabilia. He also loved his cats and especially enjoyed spending time with his parents. To send flowers or a remembrance gift to the family of Edward Larry Gallegos, please visit our Tribute Store. "Email Address" would like to share the life celebration of Edward Larry Gallegos. Click on the "link" to go to share a favorite memory or leave a condolence message for the family.